Winter Magic in the Fannaichs! Sunday’s forecast was looking good from several day’s ahead. I had agreed to get out in the hills with a friend and we had a chat on Saturday night about where to go. It was difficult to choose with so many options. It looked like a day where you could pick your hill, any hill! In the end we decided to go for some old favourites of mine in the central part of the Fannaichs range of Wester Ross, Northwest Highlands. Yesterday was a good day up Am Faochagach, a Munro in the Beinn Dearg group in Ross-shire. We took a route following a winding ridge from the Glascarnoch dam. This gave a nice high-level route with easy walking on heath type terrain, although it was a little boggy in places reaching the ridge. It was sunny and clear in the morning with a nice inversion before some dense cloud swept in from the west, just in time for us to reach the summit! It never felt cold though and the snow cover is really sparse. Winter gear was left in the car and it felt more like spring. Mainly snow is only left on the flanks of ridges or up on north or north-east faces. A cold blast is due this week though, so fingers crossed for some winter! The Beinn Dearg Group from Am Faochagach – some snow surviving high on north and north-east facing slopes. Last week I returned north to Scotland on the Sleeper with my partner and her mum. It was refreshing to be back in the Highlands after the hustle and bustle of central London! After shopping in Inverness we were headed for the west and after a brief lunch stop in Beauly, we made all haste for Gairloch. It was great to be back in the north-western Highlands, but for our first few days we were storm-bound with sheets of rain, severe south west winds and unseasonably mild temperatures. The hills were almost completely cleared of snow. I did get out for some walks and runs but mountain-based activities, particularly of a wintery variety, were a no go. It was a shame to end 2016 this way after a year of many adventures! Then, late on Hogmany, a cold front swept down from the north and early 2017 has so far seen a completely different kind of weather and a welcome drop in temperature. There was even a brief clearing that allowed us to bring in the bells on Big Sand beach, whisky in hand, under a sky full of stars with the milky way a clear bright streak across the sky. New years day there was some nice sunshine amongst scattered hail showers. I went for a run over to North Erradale from Big Sand, which was really wet underfoot in places, then in the afternoon we drove over to Poolewe and took a walk in toward Kernsary. This was a lovely, calm walk by the River Ewe with great views of the snowy Fisherfield, Letterewe and Torridon Hills. We stopped by a river for coffee and shortbread then walked back just before it got dark. Very civilised! I got up my first hill of 2017 in on the 2nd. I chose Beinn a’ Chearchaill as it was one of the few hills in the range between Flowerdale and Glen Torridon that I still hadn’t done. It is famed for its summit views of the Torridon hills, in particular the spectacular Coire Mhic Fhearchair on Beinn Eighe. There was none of that today though as I entered the cloud at around 500m. It was very wintery with fresh snow from about 300m and the wind chill on the top was significant. The conditions made for good navigation practice and, regardless of the lack of view, the summit area of this hill is really quite a surreal landscape. This would be a good hill to go back and do again on a clear day. In the end it turned out to be a shorter walk than I expected so I also got a sunny walk along Gairloch beach on my way home. Then in the evening I managed another wee walk on Big Sand beach. I had this mile long expanse of sandy beach all to myself as I watched the final light of the day fade behind Longa Island. It is such a privelage to have places like this on the doorstep. On the 3rd we were storm bound once more and after a morning 5k, it was time to turn my attentions back to work. Then, yesterday it was time to head back to the east coast. But not before a wee trip to Torridon! The weather was much improved with light winds, cold temperatures and the cloud above summit level. 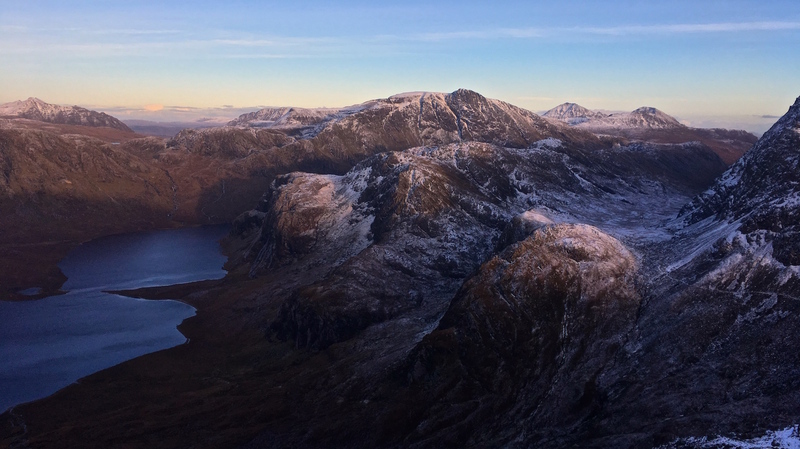 Not much snow around yet, but the views of the hills were great, particularly Liathach and Beinn Eighe. Both of these long ridges make excellent mountain days and Liathach offers one of the best ridge scrambles in the north west. Looking forward to getting back up there soon. This has been a busy week for me in the Scottish mountains. With cold, clear conditions holding on through midweek and then warmer, clear conditions at the weekend, all coinciding with the true end of my summer season’s work I was able to get out 5 of the last 7 days and continue my preparations for my winter ML assessment. On Monday morning I left the house completely undecided as to my itinerary for the day. I really wanted to do a route up a grade I snow gully out west but I feared it would just be an epic battle through powder snow. Mid-journey I decided to redirect toward Ben Klibreck, a hill much closer at hand and which, although I had been up it several times before, I had never seen the view from. The weather forecast was promising full sunshine all day. Surely this time I would see a view from the summit! What followed was still an epic battle through powder snow on the slopes of Cnoc Sgriodain and Carn an Fheidh, reaching a high point of 808m for the day and the view from Ben Klibreck eluding me once more. It had been -8C coming out the back of Lairg and many of the passing places on the road were out of bounds to a car with summer tyres such as mine, but fortunately it was quiet and I made it to the bottom of the hills with great hopes of the bog being well frozen. It was. But it was also buried deep in the snows and my progress was painfully slow as a result. By the time I reached my high point for the day, it was late, I was physically shattered and a cap of cloud had spilled down from the north covering the summit of Klibreck with more foreboding clouds lurking in the background. I admitted defeat and descended back to the car. This wasn’t any easier a task than the way up, but the views out west to Ben More Assynt were fantastic and the snow-covered spiky outline of An Teallach on the distant skyline totally made up for the fact that I hadn’t completed my day’s objective. As if to rub it in, I did get an outstanding view of Klibreck once I returned to the car. I feel snow shoes might be something worth investing in! By Wednesday I was itching to get back out and this time successfully summit a hill. Looking close to home once more I decided to go for Beinn Leoid, a corbett in far north-western Sutherland, approached via 2 lower Grahams. Circumstances meant I had a late start onto the hills. It was 1030am when I reached my start point. It was in a narrow valley at the watershed between east and west on the Lairg-Laxford Bridge road and was hidden from the sun, about 100m above sea level and it was still -1.5 with snow on the ground and an icy sheen on the tarmac. As I set off up-hill, following the route of a stalkers path zigzagging helpfully up the slope, the snow was rock solid and I had to think about whether crampons were required. But soon I burst out of the confines of the glen onto higher open ground in bright sunshine with more deep powder snow. From here I made straight for the summit of Graham number 1, Meall an Fheur Loch. I reached the summit in about 1 & ½ hours and was greeted with a phenomenal view in all directions. Foinaven, Arkle and Ben Stack out west, Ben Loyal in the north, the full length of Loch Shin in the East and Ben More Assynt in the south. This truly was a winter wonderland! I could also see Beinn Leoid and it was apparent that in these snow conditions I didn’t stand a chance of reaching it on that day. So I settled for climbing the next Graham, Meallan a’ Chuail. This was an even better hill than the first, with a fine ridge leading to the summit. It was also another physically challenging climb, ploughing up deep snow covering a boulder field. Again the summit view was outstanding and I hung around a while just savouring it. You could even see Braeriach on the horizon. A golden eagle swooped past about 50m below me. Perfect! The descent went smoothly enough, and I picked up the stalker’s path back to the road at a small cairn that I’m not sure how I found. The sunset was simply stunning and capped off probably one of my best winter days to date. On Friday I was headed south. I had a weekend walk planned with my Dad on Saturday and was due to lead a walk with my old Glasgow hillwalking club on the Sunday. But with one last day of cold, clear conditions forecast I had to do a hill en route. Due to their accessibilty from the A9 I decided to go for the East Drumochter hills. By the time I got down the road it was another late start and it was gone 11am when I was off the A9 and heading up the track. My plan had been to do both Carn na Caim and A’ Bhuidheanach Bheag. However, there was a front due and with my late start and long drive ahead I quickly realised that I should probably settle for one Munro. So Carn na Caim it was. As I climbed away from the road the views over to the west side of the pass were stunning! Up on the plateau, the conditions were perfect. Albeit I was still wading through deep powder snow with a tantalising crust that kept giving way beneath me. The sun felt warm. The cloud was rolling in from the north-west but above this the Alder hills looked stunning. And further west the Ben even made a brief appearance! I followed the fence line as it wound over the undulating country. It wasn’t long before I reached the top to be greeted with a view of the main Cairngorm massif rising above a sea of cloud. I stayed a while just drinking in the views and the enjoying the tranquility. This was the first time all day that I had escaped the continual hum of traffic on the A9. As I decended I entered the cloud that had spilled over the plateau from the west and by the time I reached the car it felt like a completely different day. Mild and grey. Change was definitely on the way. The next morning I awoke in the central belt under still under grey skies. I drove with my Dad up to Arrochar and we set off to do Cnoc Coinnich. This is a hill which until this year had been classed as a Graham, but after a re-survey it was found to be 762m high and just squeeks in as a Corbett. This change in classification seemed quite noticable on the hill as it was really very busy. There were atleast a couple of dozen people on the hill. Hardly the crowds you see on the likes of Ben Lomond, but much busier than I think the hill would have been if it was still a Graham. We probably were there for that reason ourselves! But choosing this hill on that day was a good decision well made. As we left the mess of the commercial forestry by Ardgarten the skies started to clear. From the high point on the Cowal Way we follwed the NW ridge of the hill straight to the summit. There was a keen northerly wind keeping conditions cool, but there was a thaw in full swing and we hardly had to cross any snow to reach the summit. We found a lunch spot tucked away below the summit crags out of the wind and here it felt more like spring. Blue sky now dominated and in the clear air you could see as far as Ben More on Mull. On the way down we varied the route a little traversing behind the Brack and descending down into the forestry from the Ben Donich-Brack bealach. It was a bit random but it allowed us to stay high a little longer and enjoy more of the views and warm sunshine. After another night in the central belt I was headed north once again. I met a group of 12 from the hillwalking club at the Victoria Bridge car park near Bridge of Orchy at 9am and we set off for Stob Gabhar. The forecast was for a clearing day with dropping temperatures. This didn’t seem likely with dull, grey and mild conditions prevailing but we were hopefull! In any case it was nice to be back in the area. After being the hut custodian of the GUMC hut at Clashgour for several years I am very keen on this wild country heading in towards Glen Etive. We entered the cloud around 800m with only patchy snow cover. My choice of ascent route was the Aonach Eagach ridge. This is bit more of a formidable sounding name than the reality of the ridge itself but it does narrow right down for a short section giving a nice interesting route to the summit. By the time we were up here, around 1000m, the temperature had dropped noticeably and, as I had thought, the thawing snow of yesterday was now well consolidated and rock-solid. I felt vindicated that I had insisted that everyone carry crampons but there wasn’t the continuous covering to justify putting them on. My group were all going well and everyone reached the top comfortably. As if to repay our efforts, the cloud cleared as we were eating our lunch giving spectacular views north and west, fog bows and broken spectres. I have no excuse for not getting any good pictures of this. I suppose it was just a combination of how damn cold it was and just wanting to enjoy the moment that kept my camera tucked away in the rucksack. For a further variation we descended via Sron a’Ghearrain and Clashgour Farm. This made a nice descent route, although there were some very slippy bridges in the icy conditions! The views west to the Etive Munros were phenomenal. Once we were down and been for a quick coffee in the Bridge of Orchy Hotel it was time to head home once more after a super week of walking in the Scottish Hills. Let’s hope the cold & snowy conditions return soon. With time against me but conditions looking good I decided it would be good to get out west to Assynt and take in the relatively accessible summit of Cul Mor in winter conditions before the thaw sets in at the weekend. There was much more snow around than I expected, the snow line was around 300m on the way across and there was a slow thaw during the day. It was a beautiful morning, but more of a mixed bag in the afternoon. I took in an anti-clockwise circuit of the summit and Creag nan Calman. There was deep, soft snow on the upper part of the hill and tricky conditions in places crossing boulder fields obscured by snow. It was a good ascent, with stunning views of Suilven, Canisp and the hills behind Inchnadamph. Part of the way I met another John from Ullapool. It was good to have some company on the way up and I got some good practice higher up breaking trail. After a nice summit/lunchtime chat we headed different ways and I had to navigate a little to find my way round to and then off Creag nan Calman. There was a brief break in the cloud giving an atmospheric view of Cul Beag. Picking up the outward route just west of Meallan Diomhain I was lucky to catch some amazing late afternoon winter light, bringing out all the different shades of orange and brown wonderfully and casting long shadows across the land. Unfortunately some drizzle set in about 1km from the car but it wasn’t enough to dampen a great day in Assynt. The weather for Monday was looking like the best for a wee while and with the day free I decided it was time to get and out and enjoy some of the early season snows. Strathcarron seemed like a good venue and I was keen to take in a route that was different from the standard route up this pair of hills, which is a little steep and boggy (to say the least! ), so I set off from the car park at Craig shortly after 9. My plan was to traverse the former Munro, now Corbett Sgurr nan Ceannaichean and then onto Moruisg. It’s a fairly lengthy walk-in up a track from here but you gain height quickly and the view back to the Coulin Forest, in particular Fuar Tholl, just gets better and better. Its not long before you feel like you are properly getting into the mountains. Near the first wire bridge over the Allt a’ Chonais I opted to take an old path across the hillside to cut the corner of the track. This is quite boggy and indistinct in places and propbably not worth the bother. However, it does bring you right to the start of the path up Sgurr nan Ceannaichean which is quite handy. And what a path it is! It is a bit grown-over in places and also lost in some places due to subsidence, but this is a properly old skool stalker’s path zig-zagging up this steep hillside making for an enjoyable the climb. Maybe not everyone’s cup of tea, but I enjoyed it. Just after starting up, a C130-Hercules came over the Bealach Bhearnais and flew by at eye level which was quite cool. I reached the first snow around 650m, then at 730m the path comes to an abrupt end. Its a steep climb from there up wide slopes to the summit of SnC. The view along the ridge to Moruisg was stunning. I met about 8 people on this top, the only people I saw all day. After lunch I wandered along to Moruisg in about 45 minutes. It was a lovely walk along an easy ridge with great views north to Torridon and Fisherfield. There was really only a dusting of snow on top but it was good to be on some snow for the first time this season. It was really noticable how much more snow was in the north on the likes of the Fannaichs and Wyvis but it was quite localised. After another summit break to take in the scene down the strath and out to the Cuillins which had appeared for the first time all day, I wandered down ESE to the 874m top ESE and then headed south to pick up another amazing old path, equally winding, for a knee friendly walk down to Glenuaig Lodge. From Glenuaig it’s about 8km back to the car. A long-way, but it’s a good track through some of my favourite hill country so I was quickly lost in my thoughts and didn’t notice the distance. There were a lot of red deer knocking about the glen which were fun to watch, but a bit too far away to take a picture. I was back at the car just as it got dark and the temperature was already dropping quickly. Hopefully it stays cold for some more snowy action later in the week.